A charity taster session for a week of events aimed at getting seniors to try different physical activities is to take place at the end of September. 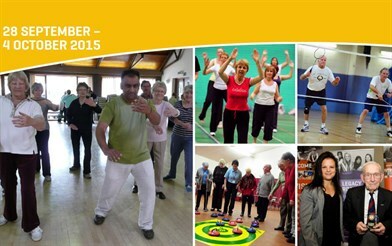 Feel Alive from 65 is a countywide campaign for older persons who want to try different activities to stay active. The week will launch in Blaby District on Monday 28 September at Braunstone Civic Centre from 1:00-4:00pm, costing just £2.50 with all proceeds going to the Alzheimer’s Society. Events on the taster day will include Tai Chi, Yoga, Seated Exercise and Kurling, the floor version of the sport normally played on ice. There will also be refreshments, health checks and a Dementia Friends session at the centre. There will be 19 activity sessions between 28 September-2 October in the district for seniors, including Fit to Dance, Zumba Gold, Badminton and Over 50s Circuits, with many of the sessions free for first timers. For more information on the activities during Feel Alive From 65 call the Health and Leisure services team on 0116 272 7703, e-mail leisure@blaby.gov.uk or visit www.sportblaby.org.uk.